Fraser Col to Emily Pass Sidle. 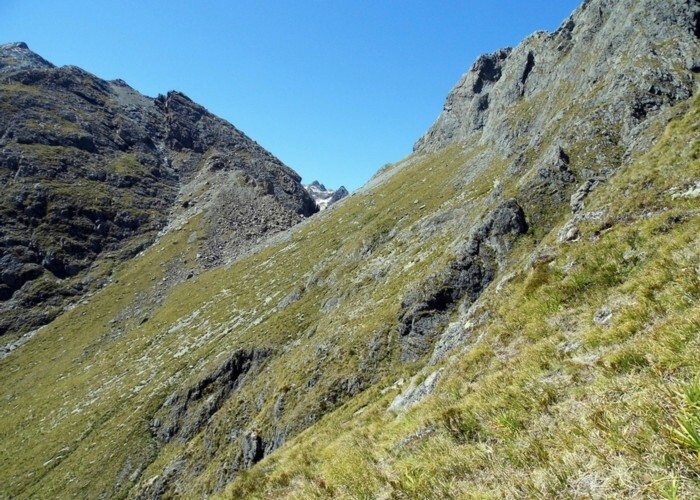 This photo is looking east at Fraser Col from the true right top of the gut of the initial climb to Emily Pass (It is looking in the opposite direction from this one: https://tramper.nz/14584/route-up-to-emily-pass/). It is possible to sidle between Fraser Col and this spot on the way to Emily Pass without having descend all the way into the basin north of Emily Peak and back up the gut. The sidle negotiates mildly sloping snow grass and passes through about 4 gullies, 2 of which have streamlets in them. Its hard to tell the exact route from this photo but basically maintain height from Fraser Col, and always pass under the bluffs while climbing in and out of the gullies along the way. From the position of the photographer descend scree into the Emily Pass gut at the foot of the larger waterfall. A surprising easy route in good conditions! Takes 30 minutes. Added 25 January 2015 by YarmossYarmoss. 2 revisions, most recently 13 October 2017 by YarmossYarmoss.